Making Do: Bookmarks. And more bookmarks. 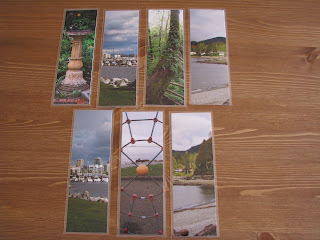 I’ve been looking for ways to use my photos in craft projects. 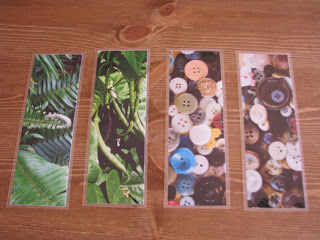 Last summer I bought a bookmark made from a photo but, because I bought some craft stuff at the same time, I lost sight of it for a while (if six months qualifies as a while). When I got home, I promptly put the bag in my sewing room, with the best of intentions to get to it very soon, where it was soon lost in a pile of other bags containing similar intentions. In a recent reorganization of the room I emptied every darn bag and rediscovered this bookmark. even with beans and ferns and buttons. Some have ribbons—the choice of whether or not to use a ribbon was determined primarily by what colors of ribbon I happened to have. I wasn’t sure how to laminate them. I went to BigName Craft Store, clutching my 40%-off-one-item coupon, to see what my options were. I was sorely tempted by the Xyron machines, which can laminate or make stickers or magnets out of just about anything you want, but even with the coupon, buying the machine and the laminating material would be a significant investment, more than a few bookmarks warranted. And I’d like to see the finished product before shelling out that kind of money. So I bought a roll of self-adhesive laminate, but I wasn’t at all happy with the results. Then I tried clear Con-Tact paper left over from some art project I did with my kids when they were little. It was better (and cheaper) than the laminate, but not at all what I wanted. Besides, using these products in a household with three cats was a pain. Remember doing experiments with magnets and iron shavings in school—how the shavings would fly toward the magnet and glom onto it? It was like that. As soon as I peeled the covering off the adhesive, it was somehow completely covered in cat hair. I took a few of my cut pictures to BigName Office Store, where, after being tempted by their little hot laminators, I repeated my mantra about not buying stuff I don’t need and marched myself over to their copy center to have the pictures laminated. They turned out great, so the next day I brought a stack had them all done—cheap. 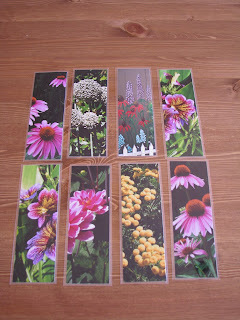 I could make hundreds and hundreds of bookmarks for the cost of a laminator. And I have lots of pictures that I could use, so I may do just that. Of course, this begs the question of what the heck I’m going to do with all these bookmarks. And don't forget them whenever your children have a school bazaar (do they collect money for class trips or such?). Bought the roll of stuff, laminate that is, and did a huge stack of paper back books for my daughter (the 5th grade teacher). Over 50 books. I'd been hitting every Half Price Book store in town (they're not in her town), and used coupons, and wanted these books to have a reasonable shelf life...thus laminating (figured she could wipe off those sticky 5th grade fingers). Without air bubbles, no way; used a ruller...tried several methods. What a job. Serviceable, not necessarily pretty. Love the pictures you used. The buttons are adorable! 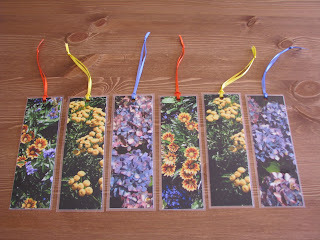 I think you'll find lots of uses for your darling bookmarks. But...you didn't say what it cost to have them down at the copy center...and we inquiring minds wanna know. Maybe rather than Christmas Cards you could send everyone a book mark with a note/Christmas newsy thing. Save the cost of cards doing that too. Had such plans of all the things I wanted to get done today, surprise...not really, it didn't happen. Sandy, they laid them out 5 to a sheet (the size they'd use for 8.5 x 11 paper) so with the tax they cost just over .20 each to laminate. Cheap, eh? I want one!! I want one!!! I want one!! I may have to copy yet another idea from you. One can never have too many bookmarks, as one can never have too many books. I love these. If you are looking for any takers, I would be proud to be the recipient of one. Hint, hint!